In the next few weeks Apple is set to announce a slew of updates to iOS and OS X. Most rumors indicate that we’ll see a lot of small improvements with every corner of the Apple ecosystem, but I’m looking most forward to the impending announcement of the new Apple / Beats product that should rival Spotify, Beats, and Google Music. First, I thought I’d talk for a moment about how I enjoy music as I think that will flavor my wish list. I’m a subscriber to Spotify and iTunes Match, using both about equally depending on context and they both do a lot of things really well and miss out on some others. I enjoy music in one of 4 main places: during my roughly 1 hour commute to and from work from my iPhone, during my workday at my desk on my Mac, while running on my iPhone (and one day my Apple Watch!) and at home, typically played throughout the house on multiple speakers via Airplay & my Mac. It’s important to me to be able to use a remote app on either my phone or my watch to control music while around the house. The way I listen to music is typically one of three “modes”: discovery, (re)discovery, and ‘hits’. At a high level, discovery for me means using something like Spotify or iTunes Radio to find new music based on things I already listen to. I do this at work a lot of the time – I’ll pick a Radio station or playlist and find some new artists this way. Rediscovery is using the Smart Playlist feature in iTunes to serve up my favorites that I might not have listened to in a while. 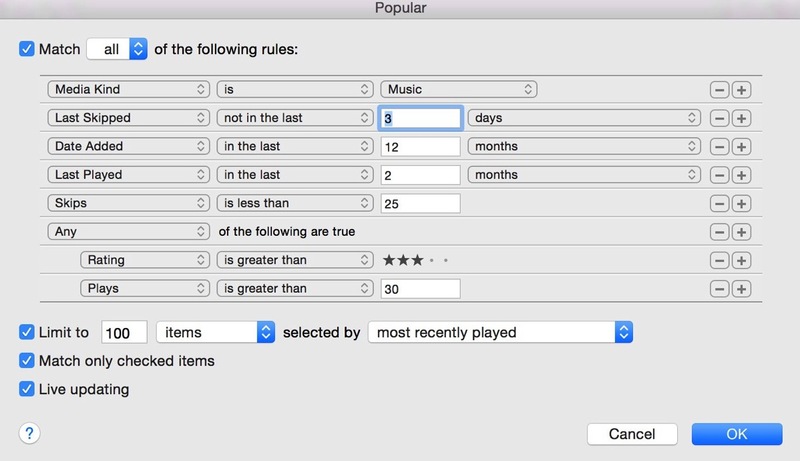 I’m kind of obsessive about metadata and Smart Playlists in iTunes, and this pays off when I can call up a playlist based on some pretty specific criteria. Yes, I realize how insane this is. ‘Hits’ means either using Spotify/iTunes Radio or Smart Playlists to serve up music I know I’m a fan of. This is great for running or driving around. Again, I make use of Smart Playlists to play a specific curated playlist. With Apple buying Beats last year, the writing was on the wall for a streaming service making its way into iTunes. Simply put, I want to have iTunes as my one-stop shop for music discovery, re-discovery and personal curation. I want to be able to solve the ‘what do I listen to’ problem that I currently have with Spotify, and have the ability to combine music I own with music I discover. Jumping between ecosystems places a mental burden on me to remember where a certain album or song lives. So, how do we get to this magical land? Conceptually this service should work like Google Music, where users can upload/match their own music but also subscribe to a streaming service to supplement their ‘owned’ music with ‘streaming’ music. This should be transparent to the end user once tracks are matched. In fact, the reasons I don’t use Google Music are mainly the lack of a good Remote system not named Sonos and the lack of a desktop application to speak of. They nailed the music management part of the streaming puzzle. However, Apple Music needs to take that concept but retain some of their core features. The core of what I want already exists within iTunes, and I hope that Apple doesn’t throw the baby out with the bathwater as they did with a refresh of their iWork apps. Smart Playlists are the backbone of what makes iTunes great and help me deal with a fairly large library of music. I realize that adding a streaming service and a match service together isn’t easy but Google’s approach to me is great. Take that, add the ability to make smart playlists based on some basic metadata, and you’re cooking. I personally only rely on metadata like last played date, date added, play counts, and ratings to create most of my smart playlists and if they are lost at the expense of adding a streaming service, I might as well use Spotify or even Google Music. Further, retain iTunes Radio and give users the option to add songs to their library or purchase them outright. Serve up recommendations similar to how Beats currently works, offering albums or curated playlists to aid in discovery. The important thing is to still make my music – regardless of if I got it from the new streaming service or it’s music that I own – the focal point instead of pushing playlists and other ‘features’ on me the way that Spotify is moving these days. iTunes Match is conceptually a very great service but it rarely works as flawlessly as I’d hope. The update times are hard to predict so things like play counts, metadata changes or new music additions take time to filter down to every device. I realize this is potentially a very complicated issue and know it’s super difficult to solve, but I’d love to see some speed/reliability improvements here above all else. Ditch ‘The Sentence’ feature from Beats. Let iTunes Radio take the place of this poorly thought out feature. I like the way that a few services handle ‘New Music Tuesday’ but nobody does it perfectly. Rdio comes the closest, offering up a list of all of the new albums available, and even notifying you in the menubar of the application if any artist you have in your collection has a new album out. I feel that sort of automation combined with the curation angle that Apple and Beats both take, breaking out genres and featuring the top new music, would go a long way to helping users not only find new popular music but also keep up with the artists that they already love. If rumors are true, allowing users to follow artists seems like this could be Apple adding in the automated notification feature. However, I hope they go on step further and allow you to be notified if any artist in your library has a new album/song out. Something that has bugged me for a while is the way Music on the iPhone works – you have to leave the Music application and go to system settings just to toggle whether the app shows all of your music or only the music you had downloaded to your device. All of the other major players do this really well, and fortunately Apple has already added this in the iOS 8.4 beta. There is a toggle to show all of your music or only downloaded music. Pretty simple – I’d like to be able to get home after my commute and hand off what I’m listening to over to iTunes to seamlessly continue rocking out. If I’m listening to a playlist or an album, that should be able to be easily continued on iTunes, my iOS device, or even my watch if possible. That’s all! Simple, right? Most of the things I’m asking for aren’t rocket science, it’s just an issue with all of the competitors doing most of the things I want, but not all of them. Apple has the ability to knock one out of the park next month and finally build the perfect system for the way I listen to music. I hope they can make it happen.